With an estimated 3.5 million vegans in the UK, plant-based Christmas options are on the up. All the meaty classics are slowly being remade into ‘veggie’ versions, but I never thought they could reimagine the humble yet heart-warming pig-in-blanket. No matter how many you cook, there never seem to be enough to go around, and now vegans and vegetarians can join in with the fun. 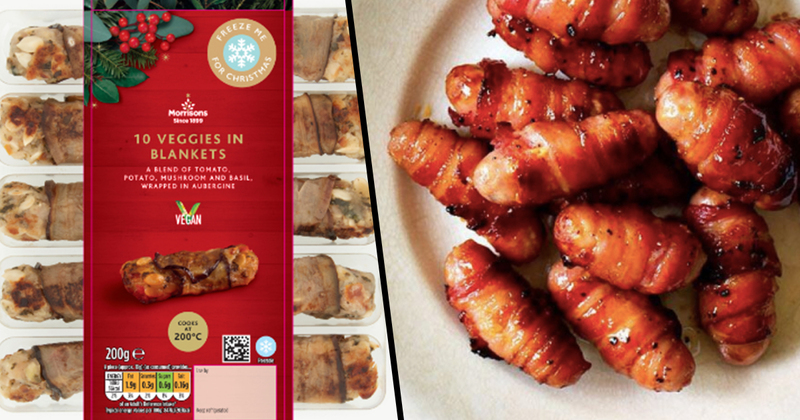 Morrisons has produced a plant-form of the festive favourite that sounds like the slightly boring older brother of pigs-in-blankets…’veggies in vests’. They are the perfect side dish to accompany the vegetarian or vegan Christmas dinner that becomes more popular with each year. The veggies in blankets, are vegan ‘sausages’ made from tomato, potato, mushroom and basil, carefully wrapped in an aubergine ‘blanket’. Sold in packs of 10, Veggies in Blankets are available now in Morrisons stores nationwide and will only set you back £2.50. They are even part of the three for £6 offer on Christmas party food which also includes vegan ‘sweet potato stacks’ and vegan ‘vegetable tempura nests’. Pigs in Blankets are arguably the best part of Christmas dinner. We’ve listened to customers who are looking for more plant-based options over the festive period and created a vegan version. As well as party food, the Morrisons vegan Christmas offering also includes products such as The Best Cranberry and Pistachio Nut Roast and The Best Pumpkin & Sticky Fruit Festive Stuffing. Morrisons seems to be leading the way for the growing meat-free appetite in the UK. They recently launched its own vegan ready meals range including bean ‘non carne’ and dairy-free Red Leicester cheese. David Potts, the Morrisons chief executive, said their foray into the vegan world is an attempt to appeal to younger people who are more conscious and ethically minded than ever before, the Guardian reports. Potts seems to be on to something as a recently study found that older generations don’t think much of veganism. A study of 2,000 adults identified a vast generational divide on veganism, vegetarian and flexitarian lifestyles. The research revealed younger Brits are far more likely to embrace ‘Meat-free Mondays’ or even completely follow a vegan or vegetarian lifestyle. But nearly half of older people don’t believe that going vegan will have a ‘positive impact’ on their health and fitness. And while millennials are twice as likely to see veganism as ‘trendy’ and ‘cool’, more than one in four over 50s see it as nothing more than a ‘trend’. The study also found three in 10 adults between 18 and 30 describe a vegan lifestyle as ‘healthy’, whereas just 18 per cent of those aged 51 or above say the same. Regardless of the age divide, it is a choice being made by an increasing number of people and having an effect on the demand and supply of vegan alternatives on the market. Gone are the days of vegans only being able to eat parsnips, carrots and sprouts at Christmas time.